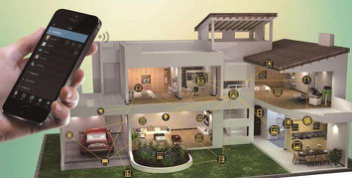 Smart Home Solution is built on connecting lighting system, curtain control, air Monitoring, security system, household electrical appliances and other equipment together through Internet of Thing, it can realize the function of home electrical appliance control, lighting control, burglar alarm and HAVC control. Compare to the traditional Home Solution, Smart Home Solution is not only for traditional living functions, but also for network communications, equipment automation and information appliance, it can provide full range of information interaction with low cost. By operating APP in the smart phone, users can remotely control the switch, brightness and color of light, set the scene modes that fits their moods. With the remote control, users can set the switch time of the curtain and control the curtain at their will. With indoor anti-theft, fire protection, gas leakage prevention and emergency rescue functions, Smart Security System is easily achieve home intelligent security through remote voice control, timing control, intelligent lighting and home appliance control. By operating Bluetooth smart socket, smart lock and smart platooninsert and other household electrical appliances, it can easily achieve the timing control, scene control and wireless remote control of household appliances. In addition to click the button to control the air conditioner, we add Bluetooth module and temperature sensor to remote control it. User can directly control the air conditioner by the APP, setting the boot time and specific temperature.